Hello friends, try to solve this simple and interesting math puzzle of these funny animated animals. 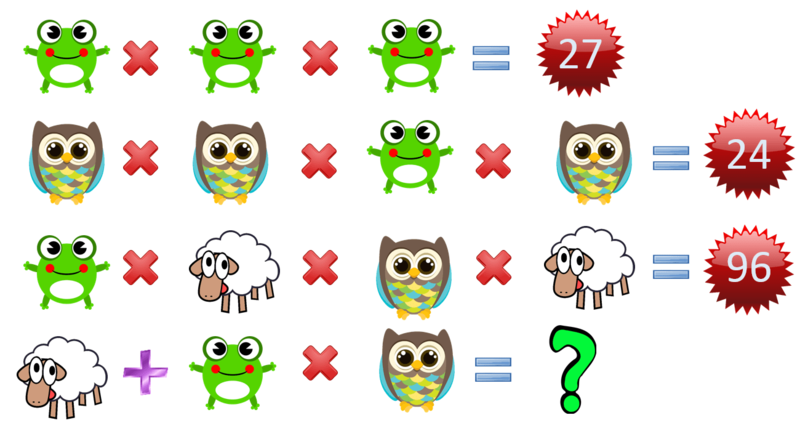 Find the value of Sheep, Frog and Owl and then solve the last equation of the puzzle. Check the puzzle image below and find the answer. S + F × O = ?, ⇒ 4 + 3 × 2 (Multiplication First then Addition) ⇒ 4 + 6 = 10 Ans. Is your answer is correct? Check out our other interesting and difficult brainteasers and logic puzzles. For more fun connect with us and get funny and viral news, stories and genius puzzles in your timeline. Thanks and please share!